The latest three spaceflyers launched to the International Space Station from the Baikonur Cosmodrome in Kazakhstan on March 25, 2014. A Russian Soyuz rocket launched an international trio of crewmembers to the International Space Station today (March 25), sending them into space for a 5.5-month stint on the orbiting laboratory. 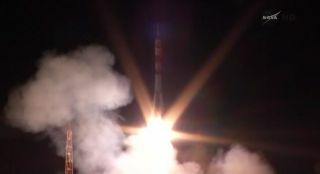 The rocket launched a Soyuz capsule housing NASA's Steve Swanson and cosmonauts Alexander Skvortsov and Oleg Artemyev at 5:17 p.m. EDT (2117 March 26 GMT) from the Baikonur Cosmodrome in the Central Asian nation of Kazakhstan, where the local time was 3:17 a.m. Wednesday. The three crewmembers are scheduled to dock with the space station at 11:05 p.m. EDT (0305 March 26 GMT), and you can watch the Soyuz's arrival live on Space.com via NASA TV starting at 10:30 p.m. EDT (0230 March 26 GMT). Expedition 39 crew sits inside the Soyuz TMA-12M spacecraft prior to launching to the International Space Station on March 25, 2014. The stuffed toy duck at left will serve as an indicator of reaching orbit, when it begins to float in zero-g. In keeping with tradition, ground controllers piped upbeat rock and country music into the Soyuz spacecraft for the three crewmembers before launch. Skvortsov also hung a small duck talisman nicknamed "Quack" in the crew capsule before liftoff. The duck toy was given to him by his daughter, according to Byerly. Swanson, Artemyev and Skvortsov will join NASA's Rick Mastracchio, Japanese astronaut Koichi Wakata and cosmonaut Mikhail Tyurin, rounding out the station's Expedition 39 crew. The three newest residents of the space station are expected to float through the hatch about two hours after they dock to the outpost. While the relationship between the United States and Russian governments has been tense due to Russia's annexation of the Ukrainian region of Crimea, the space station launch was unaffected by the recent crisis, NASA officials have said. Tuesday's launch marked Swanson's third trip to space. He is the veteran of two space shuttle missions, but this will be his first long-duration stay in orbit. Swanson and the other space station astronauts have some fun plans for their free time onboard the space station. "For my free time … the first thing is probably [to] look out the window at our beautiful planet," Swanson said during a prelaunch news conference. "We do plan on doing a few other fun things onboard. We're going to watch the World Cup and it should be a good game." Skvortsov is also a veteran spaceflyer. The cosmonaut stayed onboard the space station in 2010, racking up 176 days in space. Artemyev is making his first flight to space after participating in the Mars 500 mock Mars mission — an exercise designed to place volunteers in isolation on Earth for more than a year to simulate a mission to the Red Planet. At the moment, Soyuz spacecraft are the only vehicles that transport NASA astronauts to the space station. NASA officials hope to start using private spaceships to ferry astronauts to and from orbit by 2017. It's a busy week at the space station. The private spaceflight company SpaceX is planning to launch their third official resupply mission to the orbiting outpost using their Falcon 9 rocket and Dragon capsule on Sunday (March 30).